Here’s the state profile for North Dakota. To review the entire profile, open the PDF that is attached to this post. The Community Violence Intervention Center (CVIC) in Grand Forks has launched a community wide initiative to end violence in two generations. The Safer Tomorrows Road Map lays out a comprehensive plan to end violence by providing safety and healing services to those who have already experienced trauma and providing primary prevention programming in Grand Forks County schools to prevent violence before it happens and change the social norms surrounding it. 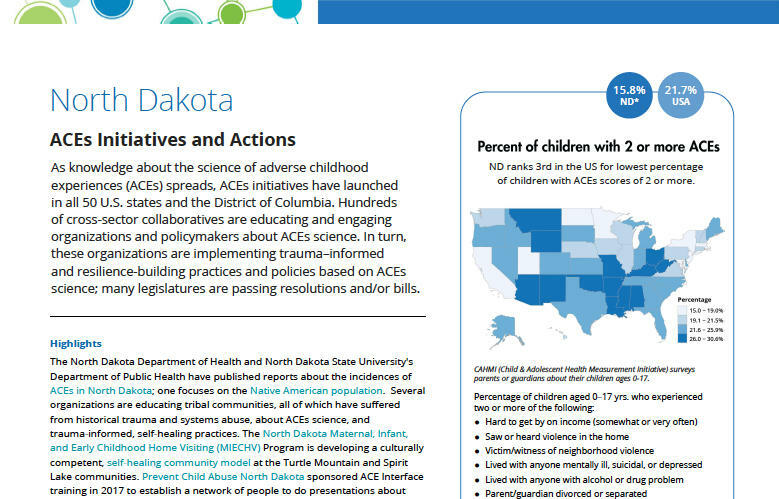 Through this initiative, CVIC is offering evidence-based therapies, such as Eye Movement Desensitization and Reprocessing and Trauma Focused Cognitive Behavioral Therapy, to youth and adults to address trauma caused by ACEs. On a state level, the Treatment Collaborative for Traumatized Youth maintains an updated list of therapists trained in evidence-based therapies to address ACEs and other trauma experienced by youth.